Have your students explain the operation of this very simple MOSFET circuit, describing how the inverse logic state is generated at the output terminal, from a given input state. Discuss with your students the simplicity of the CMOS inverter, especially contrasted against a TTL inverter circuit. Explain what specific conditions each protection diode protects against. Two of the diodes protect against input voltages exceeding the supply rails, while the third diode protects against a reverse-connected power supply. It is important that students realize these "protection" diodes do not allow circuit designers and builders to disregard good design practices with impunity. Ask your students, in each case, how each protection diode accomplishes its task of protecting the MOSFETs from damage. Does this mean the gate circuit will be able to withstand abnormal conditions indefinitely? Why or why not? 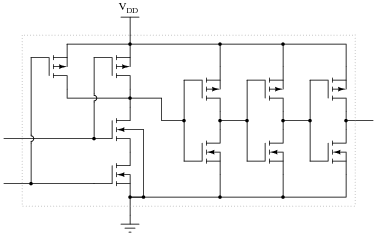 The DIP circuit is a hex inverter (it contains six ïnverter" or "NOT" logic gates), but only one of these gates is being used in this circuit. The student's intent was to build a logic circuit that energized the LED when the pushbutton switch was unactuated, and de-energized the LED when the switch was pressed: so that the LED indicates the reverse state of the switch itself. The student builds this circuit, and it is found to function perfectly well. Explain the purpose of the resistor on the input of the inverter. What is it there for? What might happen if it were to be removed from the circuit? Also, explain why the inputs of all the unused inverter gates in this IC have been either connected to ground or to VDD. Is this necessary for the circuit to work properly, or is it just a precautionary measure? 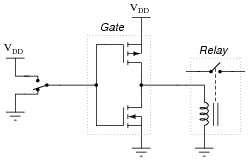 The resistor on the input side of the gate functions as a pulldown, to provide a solid "low" state to the gate's input when the switch contacts open. Shorting all unused gate inputs to either ground or VDD is merely a precautionary measure. It prevents unnecessary power draw from the supply, and possible IC overheating. Discuss the problem of "floating" or "high-Z" states with your students, especially in the context of CMOS. What is it about the nature of a CMOS circuit that makes floating inputs especially troublesome? Ask your students to contrast this against floating TTL inputs. This is a NOR gate. 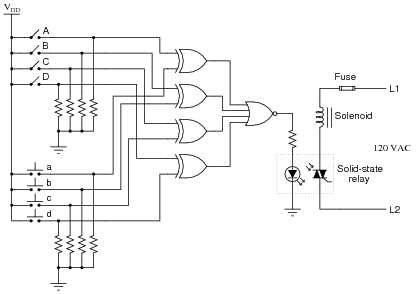 Follow-up question: identify a series of "thought experiments" you could perform on this circuit schematic to determine the identity of the gate. In other words, document what imagined conditions you would subject this gate to, and what the resulting output states would signify, in answering the question of what type of gate this is. CMOS logic gate circuits are the easiest of all the gates to analyze internally! Discuss with your students why the second-from-the-top MOSFET uses an independent substrate connection (as opposed to making it common with the source, as usual). What is the typical power supply voltage range for a CD4xxx series (or MC4xxx series) CMOS logic gate? How does this compare with the allowable power supply voltage range for a standard (5 volt) TTL logic gate? Consult a datasheet for your answer. 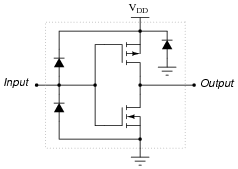 3 to 18 VDC is typical, though some integrated circuits may have slightly different ratings. This question gets students in the habit of consulting datasheets to obtain information on logic gate circuits. Datasheets are a wealth of technical information, and students absolutely have to become adept at referencing them to obtain the information they need to build and troubleshoot logic circuits. 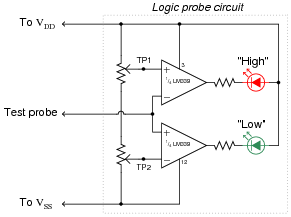 When this logic probe circuit is connected to the VDD and VSS power supply terminals of a powered CMOS circuit, what voltage levels should test points TP1 and TP2 be adjusted to, in order for the probe to properly indicate "high" and "low" CMOS logic states? 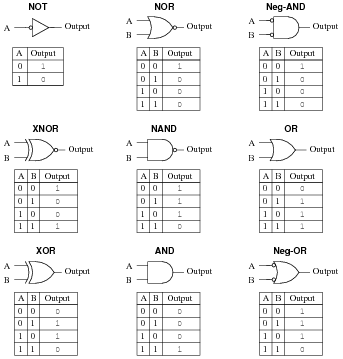 Consult a datasheet for the quad NAND gate numbered 4011. This is a legacy CMOS integrated circuit. I'll let you do your own research on this question. DO NOT obtain your answer from a textbook, but consult a manufacturer's datasheet instead! You will find that the acceptable voltage levels vary with the power supply voltage, but that the percentages are rather constant. Follow-up question: write a formula for calculating appropriate current-limiting resistor sizes for the two LEDs in this circuit, given the value of +V and the LED forward voltage and current values. The most obvious lesson of this question is to introduce (or review as the case may be) the purpose and operation of a logic probe. However, this question is also a veiled introduction (or review) of CMOS logic levels. The four pushbutton switches (a, b, c, and d) are accessible to the person wishing to enter the door. The four toggle switches (A, B, C, and D) are located behind the door, and are used to set the code necessary for entering. Explain how this system is supposed to work. What are the logic states of the respective gate outputs when a matching code is entered through the pushbutton switches? How about when a non-matching code is entered? Do you see any security problems with this door lock circuit? How easy would it be for someone to enter, who does not know the four-bit code? Do you have any suggestions for improving this lock design? The most obvious problem with this door lock system is the small number of possible codes. It would be rather easy (especially for someone adept at counting in binary!) to simply try all the possible combinations until they gained access. Here is what I recommend as a strategy for improving the level of security offered by this system: install a fifth pushbutton switch as an Ënter" key. If someone enters the correct four-bit code and then pushes the Ënter" button, the door will open. However, if someone enters the wrong four-bit code and pushes the Ënter" button, the door will not open and a loud alarm will sound! This makes it "risky" to enter a wrong code, thus improving the security of the system. Follow-up question: modify the circuit shown to implement an improved measure of security - either the strategy suggested or one of your own design. I strongly suggest you take the time to implement an improved-security design with your students. A practical project such as this sparks a lot of interest, and thus provides an excellent learning opportunity. Not only does this question afford the opportunity to analyze logic gates, but it also provides a context in which to review optocouplers and TRIACs. Ask your students what the labels "L1" and "L2" mean, with reference to AC power circuitry, as well. As far as the basic logic function is concerned, the additional transistors are unnecessary. However, the "buffering" they provide does serve a useful function. What is that function? Are there any disadvantages to buffered logic gates, versus unbuffered? Buffered gates exhibit better noise immunity than unbuffered gates. One disadvantage to buffering, though, is increased propagation delay time. Follow-up question: identify the on/off states of all transistors in the buffered circuit for both (high and low) input conditions. Texas Instruments publishes an excellent application report (SCHA004 - October 2002) comparing buffered versus unbuffered CMOS logic gates. I highly recommend it for your reference. In the early days of solid-state logic gate circuit technology, there was a very clear distinction between TTL and CMOS. TTL gates were capable of switching on and off very fast, required a tightly regulated power supply voltage, and used a lot of power. CMOS gates were not quite as fast as TTL, but could tolerate a much wider range of power supply voltages and were far less wasteful on power. Then, during the 1980's a new technology known as high-speed CMOS, or HCMOS, entered the scene. Explain what HCMOS is, how it compares to the older TTL and CMOS families (54/74xx and 4xxx number series, respectively), and where it is often used. Hint: high-speed CMOS bears the same numerical codes as the old TTL 54xx and 74xx series ICs (e.g. 74HC00 instead of 7400). I'll let you research the answer to this question! 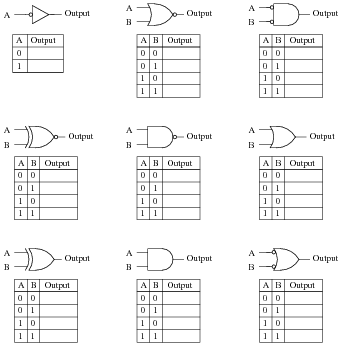 High-speed CMOS was a very important developmental milestone in digital logic gate technology, and it is essential for modern (2005) students of electronics to be aware of since it is so widely used. In many ways it blends the best of the old TTL and CMOS worlds, with few disadvantages. 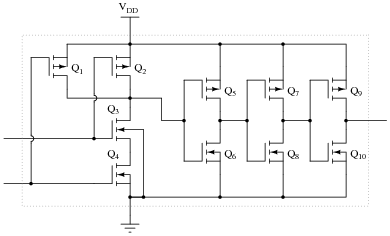 In high-speed digital circuits, a very important logic gate parameter is propagation delay: the delay time between a change-of-state on a gate's input and the corresponding change-of-state on that gate's output. Consult a manufacturer's datasheet for any CMOS logic gate and report the typical propagation delay times published there. I'll leave the research of specific propagation time delay figures up to you! The reason propagation delay exists is because transistors cannot turn on and turn off instantaneously. 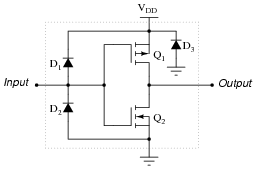 In insulated-gate field-effect transistors, this is primarily due to the time required to charge or discharge the gate-to-channel capacitance. Explain why this limit exists. What is it about the construction of CMOS logic gates that inherently limits the number of CMOS inputs that any one CMOS output can drive? What might happen if this limit is exceeded? Fan-out for CMOS is a quite different than fan-out for TTL. Most importantly is that CMOS fan-out is inversely proportional to operating frequency. Explain why. A fan-out limit for CMOS exists because CMOS outputs have to source and sink capacitive charging and discharging current from the CMOS inputs. I'll let you determine why this limit is frequency-dependent. Specifically, how much noise margin do digital circuits exclusively composed of CMOS gates have? How does this compare with the noise margin of all-TTL circuitry? Note: you will need to consult CMOS gate datasheets to answer this question properly. A trend in CMOS logic gate development is toward lower and lower operating voltages. The ÄUC" family of CMOS logic, for example, is able to operate at less than 2 volts VDD! 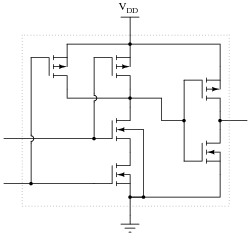 Explain why this is a trend in modern logic circuit design. What benefits result from lower operating voltages? What possible disadvantages also result? Lower operating voltages result in less power dissipation. However, noise margins become "tighter" under the same conditions, which is a disadvantage. Discuss this trend with your students, citing examples from industry literature if possible. Be sure to ask your students why lower operating voltages reduces power dissipation (with reference to Joule's Law, please! ), and also why this reduces noise margins. Diode D1 fails shorted: Output always in low state, possible damage to circuit when input is forced low by another gate (or switch). Diode D2 fails shorted: Output always in high state, possible damage to circuit when input is forced high by another gate (or switch). Transistor Q1 fails open (drain to source): Output cannot source current in high state, but is still able to sink current in low state. Transistor Q2 fails open (drain to source): Output cannot sink current in low state, but is still able to source current in high state. Transistor Q1 failed shorted (drain to source). Transistor Q4 failed open (drain to source). Transistor Q5 failed open (drain to source). Transistor Q10 failed shorted (drain to source). Discuss with them why this approach may be helpful in determining possible component faults in the integrated circuit. Both switches LOW, no light. One switch HIGH, the other switch LOW; LED lights up. One switch LOW, the other switch HIGH; LED lights up. Both switches HIGH, no light. Instead of acting as a NAND gate should, it seems to behave as if it were an Exclusive-OR gate! 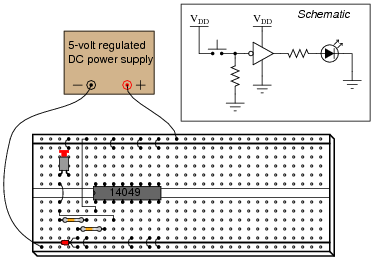 Examining the circuit for mistakes, the student discovers missing power connections to the chip - in other words, neither VDD nor VSS are connected to the power source. While this certainly is a problem, the student is left to wonder, "How did the circuit ever function at all?" With no power connected to the chip, how is it possible that the LED ever lit in any condition? The chip's internal input protection diodes allowed the switch inputs to supply operating power to the MOSFET transistors. As an instructor of electronics, I've seen students make this mistake countless times. What is particularly troublesome about this error is the seemingly intermittent behavior of the chip. Without power supplied to the chip, most students assume there would be no function at all. So when they see the chip functioning adequately in some of its circuit's states, they are inclined to assume power is not an issue! 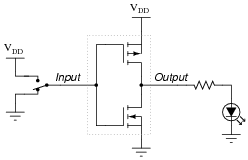 In CMOS circuitry, one side of the DC power supply is usually labeled as "VDD", while the other side is labeled as "VSS". Why is this? What do the subscripts "DD" and "SS" represent? The labels VDD and VSS are supposed to mean "power supply to drain and source sides of MOSFETs, respectively. This nomenclature is actually a holdover from obsolete NMOS gate designs, which used N-channel MOSFETS exclusively. Even though it doesn't make much sense in CMOS circuits (you'll see why if you examine the internal schematic diagram for a CMOS gate), it is the standard way of denoting power supply terminals for CMOS circuits. Follow-up question: what polarities do these respective labels represent? Ahhh, the vestiges of yesterday's technology! What can I say? Sometimes terms ßtick" even when it makes little sense for them to. Is this gate circuit configured to source load current, sink load current, or do both? In this particular case, the way the load (LED) is connected to the output of the gate, the gate will only sink current. However, the gate is capable of sourcing current to a load, if only the load were connected differently. Follow-up question: re-draw the circuit to show the gate sourcing current to an LED load. This very important concept is best understood from the perspective of conventional current flow notation. The terms seem backward when electron flow notation is used to track current through the output transistor. Normally, it would be considered good design practice to connect a commutating diode in parallel with the relay coil, to prevent high-voltage transients when the coil is de-energized. However, this is not necessary when a CMOS gate drives a coil. Explain why. If you thought the answer to this question was, "because MOSFET transistors are immune to damage from high-voltage transients," you were wrong. If anything, MOSFETs are even more susceptible to damage from high-voltage transients than BJTs, given their thinly insulated gates. The correct answer has to do with the bilateral (non polarity-sensitive) nature of MOSFETs when conducting. Trace the direction of current through the relay coil while energized, and at the point in time when the gate output switches to a "low" state, and you will understand why no commutating diode is necessary in this circuit. By examining one of the ancillary benefits of using CMOS instead of TTL, students get a good review of inductor and transistor theory. Ask your students to explain why a TTL gate would require the relay coil to have a commutating diode, lest the gate be destroyed by inductive "kickback." 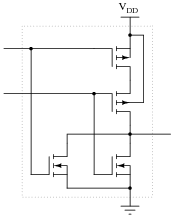 A problem unique to certain types of CMOS logic gates is something called SCR latchup. This is an abnormal condition capable of ruining a circuit, or at the very least causing operational problems in a circuit. Explain what this phenomenon is, and what causes it. 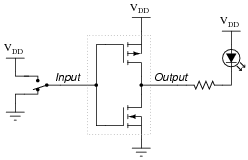 If an input or output of a CMOS gate circuit is driven above VDD, even momentarily, the circuit may "latch" like an SCR, causing VDD to become shorted to VSS internally. This is made possible by the way CMOS transistors are manufactured on the integrated circuit's substrate. Challenge question: referencing a cross-sectional illustration of a CMOS gate integrated circuit, show the "SCR" formed by the transistors, and explain how it may be "fired" by excessive input voltage to the gate. Based on their knowledge of thyristors, your students should be able to tell you how to best ünlatch" a CMOS gate stuck in this condition. Challenge them with this problem, and also with the question of how one might detect such a condition as it's happening. Mention to your students that not all CMOS families exhibit this problem, and that manufacturers have been keen to address serious design faults such as these. If nothing else, though, this should reinforce the lesson that one should never exceed the supply rail voltage for any type of active circuit, be it an op-amp, gate, or something else, unless expressly permitted by the manufacturer.